I arrived in Rome early this morning [3 January 2017] on the first flight from Dublin, and I am staying in the ‘Eternal City’ until late on Thursday. This must be my tenth visit to Italy, but it is over ten years since I visited Rome. 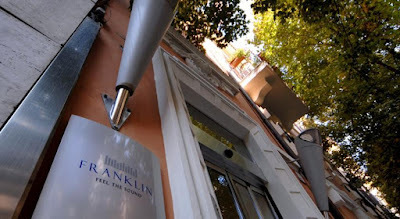 This week I am staying at the Hotel Franklin Feel the Sound on Via Rodi. The hotel is set in Rome’s elegant Prati district, between the Vatican walls and Piazza Mazzini. I am just a few steps from the Vatican and the Sistine Chapel, and from here I can walk to Saint Peter’s Basilica and Castel Sant’ Angelo in just minutes. If the weather is as good as it promises I hope to enjoy breakfast in the garden each morning. The hotel, which is part of the Best Western Group, and is a music-themed hotel. The nearby metro stops Ottaviano and Cipro-Vatican Museums, and Ottaviano is on line A, the same line as the Spanish Steps and Termini Train Station. Prati is known for its wide, sweeping avenues, elegant buildings, and modern European charm. The grid layout and elegant ‘Art Nouveau’ and ‘Umbertino’ style give Prati a unique personality, so that it has a distinct personality and a style reminiscent more of a quartier in Paris than a former marshland in Rome. Wine bars, live music venues and international and classic Roman restaurants are spread throughout the neighbourhood and are mostly frequented by local Italians. Its convenient location above the Vatican and across the Tiber, its shopping streets and its restaurants are said to make it the Romans’ best-kept secret. Apart from pasta and wine, my only agenda is some sight-seeing strolls. With Rome on my doorstep and the Vatican just a few steps away, join me on walks and for my surprises over the next few days. I am on my way to Rome this morning [3 January 2017] for the next few days. This is planned as a city break before returning to work, but it is also an opportunity to visit some important sites in Church history, and to have time for prayer and reflection. All Saints’ Church (Anglican), which was established in Jakarta in 1819, is the oldest English-speaking church in Indonesia. Today, the church is under the episcopal care of the Bishop of the Anglican Diocese of Singapore. The Deanery of Indonesia was established in 1993 with the hope of laying the foundations for the future Diocese of Indonesia. The Anglican Church in Indonesia is formally registered as the Gereja Anglikan Indonesia (Anglican Church of Indonesia), and reaches out to the indigenous people of Indonesia. All Saints’ Church in Jakarta dates from 1819 and is the oldest English-speaking institution in Indonesia. It was first a base for the London Missionary Society’s mission to China, then a colonial chaplaincy and for the last 50 years has been an international church. The name only dates from 1950. For over a century before that, the Dutch new it as Engelse kerk and the Indonesians as Gereja Inggris, literally ‘the English Church.’ At its foundation, the Church was a collecting station for missionaries trying to reach China, Japan and other Asian nations, and was bought in 1819 in the name of the London Missionary Society Mission Station in Batavia. 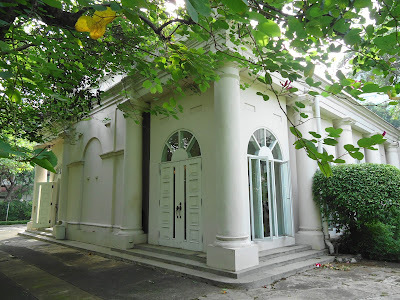 In 1843 the church became the Church of the British Protestant Community (BPC) because it became increasingly less of a missionary station and more a place of worship for the growing foreign community of Batavia (Jakarta). At that time, the BPC Committee also became responsible for recruiting and paying chaplains. In 1950, the Church became known as All Saints’ Church and has become an International Church of abbout 30 different nationalities and many church backgrounds. In the USPG Prayer Diary, the Revd Henok Hariyanto, of the Church of the Good Shepherd, wrote this week about his work on the island of Batam in a poor slum community. Pray for the Anglican Church of Indonesia as it pursues its mission to plant churches in the capital [Jakarta] and key cities. I John 2: 29 to 3-6; Psalm 98: 2-7; John 1: 29-34.